In a recent conference presentation I referenced several studies in order to give perspective on the scope of the global food waste problem. For example, a 1977 study noted that 20% of the food produced for human consumption in the U.S. (with an estimated value at the time of $31billion) was lost annually. Twenty years later, a study by Kantor and others estimated U.S. food losses at 96 billion pounds per year – or about 27% of the food available for human consumption. A recent study by NRDC noted that 40% of the food in the U.S. is not eaten – with an estimated value of $165 billion annually. Thus, it seems that in the U.S. while we continue to advance in multiple areas — we are regressing in terms of wasting food. Excessive food waste is not unique to the U.S., however. WRAP, for example, notes that U.K. households waste about 33% of purchases. Significantly, that study noted that with proper management more than 60% of that food could have been eaten. In addition, about 25% of avoidable food waste was discarded in a whole or unopened state — indicating both a high level of waste and strong potential to make use of it. A study by the Stockholm International Water Institute (SIWI) indicated that food losses and wastage could be as high as 50% from field to fork, while another study by FAO estimates that about 1/3 of all edible parts of food produced for human consumption — about 1.3 billion tons — goes to waste annually. 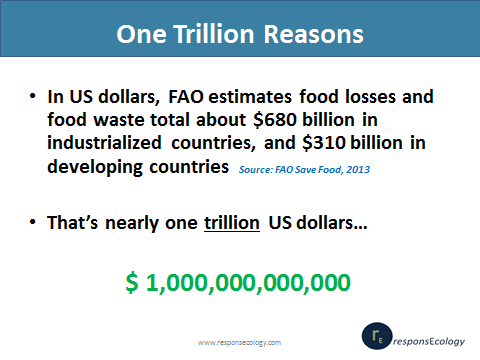 Finally, FAO’s Save Food Initiative notes that food losses and waste total roughly $680 billion (US dollars) in industrialized nations and $310 billion (US) in developing countries annually. Combined, that’s nearly $1 trillion (US) of food waste occurring annually across the globe — food that could go toward solving hunger, and food that could be prevented from harming the environment as it decomposes in landfills. Viewed differently, that’s about one trillion reasons for reducing global food waste and driving the change needed to redirect that excess to areas where it is needed — a critical effort if we are to successfully feed 9 billion by 2050.